The name Perticaia is familiar to lovers of big Italian reds, but its meaning – “plow” in the local dialect – likely isn’t as well-known. It is, however, an apt description of how Azienda Agraria Perticaia has forced its way through to the top of the critical food chain when it comes to Montefalco Sagrantino wines. For that, Perticaia can thank both timing and focus. The brand was founded by Guido Guardigli towards the end 1990s, when Montefalco began a quality boon and a production boom, during which the number of wineries in the region nearly quadrupled. 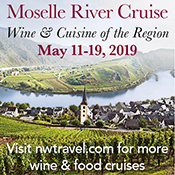 They now farm some sixteen hectares of vines, with not an International grape variety to be found among them, and more or less focus on yields that take produce about one 750ml bottle of wine per plant. Of their 125,000 bottle annual production, a whopping seventy percent gets exported, which means that their oenologist Alessandro Meniconi (working with consultant Emiliano Falsin) is a self-proclaimed jack-of-all-trades, handling (among other things) some export management duties, as well. 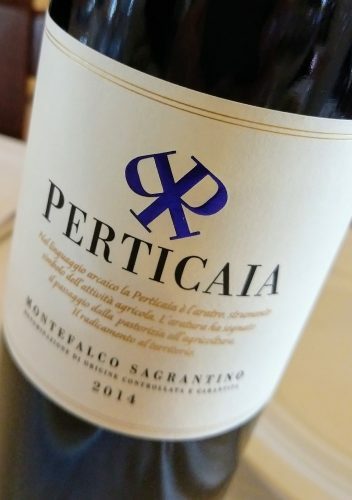 Among Montefalco Sagrantino producers, Perticaia is one of the more fastidious when it comes to production techniques, and understanding those is key to getting a full grasp of why their Sagrantino releases are so appealing at such young ages. Only about fifteen percent new French oak is used, with the remainder in some cases being as old as six years, which is kind of like the dotage period in French oak barrel terms (they’re making a push to move towards higher use of older, larger barriques, too). Not to be confused with, well, every other rendition of Trebbiano in Italy (with which it shares little genetic history), Spoletino is one of the most exciting vinous things happening in the Montefalco region. 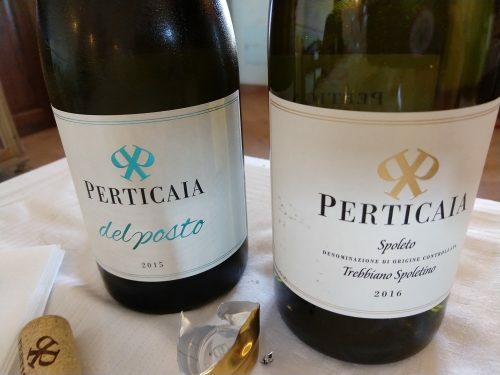 Being one of the first producers to work with Spoletino more seriously, Perticaia has crafted a lively, lovely, and complex rendition; tropical, floral, mineral, creamy, and textural, with hints of saline, citrus pith, and all-around loveliness. I suppose that when one names a wine “local,” the message is about as blunt as it can be. Heady, floral, and honeyed, “del Posto” is a bigger take on Spoletino. Tropical fruits combine with cream, citrus, lees, and late-harvest style richness, all underpinned by ample structure and nice freshness. But it’s that perfume on the nose that will put impure thoughts in your head, and make you think of alternative meanings of their namesake’s translation. 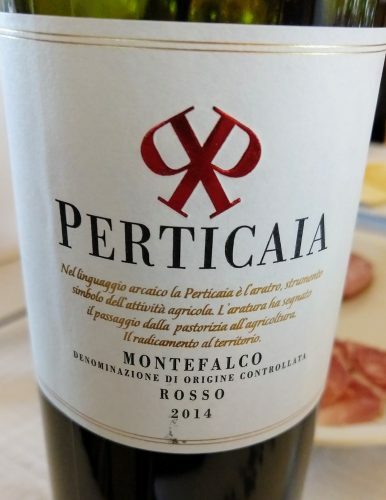 Peticaia use the standard Sangovese/Sagrantino blend for their Montefalco Rosso, but instead of the more popular choice of Merlot, they employ the wily (and oft-underrated) Colorino. This red sees no wood, and the result is spicy, fresh, chewy, and approachable, with cherry flavors, orange peel notes, and floral hints. The wood-aged version of their Montefalco red blend is so similar in flavor profile to the Rosso that they could be mistaken for twins rather than the bigger-younger brother pair that they really are; only in this case, the blend is decidedly more “manly” (think meatiness, game, and wood spices). It’s silkier, too, with more grip and richness. Lacking in character, this is not. And now for the long-overdue moment… you already know that I’m going to say that this is good. Plummy, with ample dried herb notes, along with smoked game meats and leather, this is a complex, juicy nose that ultimately finds its foundation in black cherry fruits. The mouthfeel is superb; silky to start, grippy in the center, and spicy/herbal on the way out, with a long exit and sweet, ripe fruit and cocoa throughout. 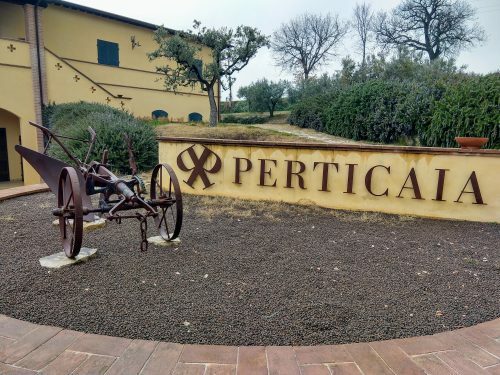 If you’ve any doubt about Perticaia’s maceration techniques, I can attest to the viability of their not-so-recent Sagrantino releases, which we also tasted during my visit. Specifically, the 2013 is dense, plummy, velvety, and full of that telltale cocoa spice, but is noticeably bigger/richer in fruit and power than its 2014 counterpart, maybe a bit more textured, and just as poised, lengthy and complex. Going back a bit further, the 2009 incarnation is savory, spicy, and harmonious, exerting its tension through a pleasant battle of fruity chewiness and a grippy, lifted palate. It’s still a baby, too. Finally, there’s the 2004, which was essentially crafted using brand-spanking new Sagrantino vines. The quality here is striking for such young bucks; cigar, graphite, smoke, game meat, earth, and wood are present, along with stewed plums and an almost aged-Bordeaux-like presentation. It’s still quite powerful (hello… Sagrantino! ), but that won’t stop you from drinking more than your fair share of it, if you an find it.